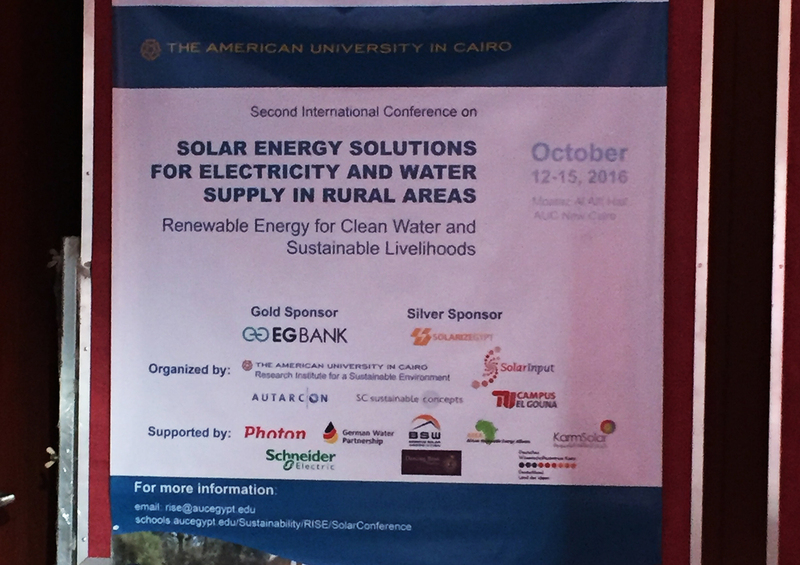 Between October 12 and 15, 2016, the Research Institute for Sustainable Environment (RISE) at the American University in Cairo (AUC) held the Second International Conference on Solar Energy Solutions for Electricity and Water Supply in Rural Areas.1 The conference aimed to present examples of renewable energy technologies and their applications as sustainable solutions for the provision of electricity and water in rural areas in the Global South. 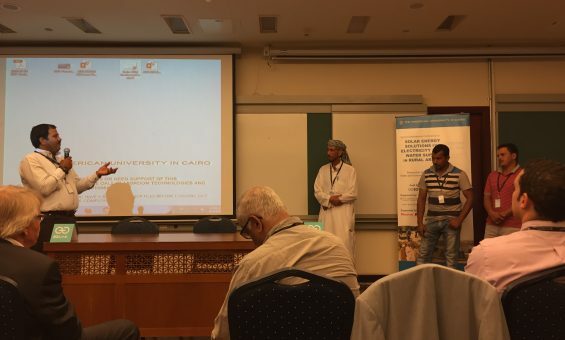 The focus of the conference was showcasing projects and technologies implemented in and adapted for the Egyptian context, with a few presentations showcasing global examples. In order to represent a wide range of stakeholders and views, the attendees included researchers, experts, renewable energy companies, as well as civil society representatives. The conference had a strong technical focus, however in this article TADAMUN will primarily focus on the issues raised during the conference regarding sustainable development, and the importance of community involvement and adapting to the local context in project planning, financing, and implementation. While access to energy is a development goal in its own right as stipulated by the Sustainable Development Goal (SDG) 7 “ensure access to affordable, reliable, sustainable and modern form of energy for all,” the keynote address by Hassan al-Fawal, Dean of the School of Science and Engineering, stressed that promoting energy contributes to other development goals as it has the potential to power technological solutions to provide poor population with access to electricity and safe drinking water. Currently, 2.7 billion people rely on biomass for heating and cooking, and the resulting air pollution causes around 1.6 million deaths in the Global South. Additionally a total of 663 million people or 9% of the global population –the majority of which are located in Asia and Sub-Saharan Africa– lack access to safe drinking water, which puts their health and wellbeing at risk. As Hubert Aulich from Sustainable Concepts further elaborated, access to water and energy is relevant to a number of the SDGs. For example, access to energy can directly and indirectly stimulate the creation of employment opportunities, businesses and herald economic growth contributing to Goal 1: “end poverty in all its forms everywhere.” In addition, access to energy is crucial for achieving Goal 6: “ensure availability and sustainable management of water and sanitation for all” as it powers solutions for pumping, filtering and/or desalinating water. In turn, access to water is needed to achieve Goal 2: “end hunger, achieve food security and improved nutrition and promote sustainable agriculture. The conference aimed to showcase different technologies that are currently being developed by researchers both in Egypt and abroad in the field of renewable energy. Experts discussed how solar and wind energy have great potential for electricity generation, pumping water for agriculture, desalinating sea water, or running wastewater treatment systems. Some of the systems were implemented, while others were still in the research phases. An important aspect that was raised by Edwin Rap from the International Water Management Institute (IWMI) is the need to contextualize the technologies developed. That it is always important to think about the unforeseen implications that will arise from the use of a particular technology, how people will use it, and how it will affect the community. Rap, who presented different water pumping collectives in the Delta, observed that the introduction of solar powered water pumps has been a positive development from the energy perspective as it uses clean renewable energy. However, given the fact that farmers could now pump water at a lower cost, they tend to pump excessively, contributing to the depletion of Egypt’s scarce water resources. It is therefore, important to view the introduction of renewable energy not merely as technologies but as complex, socio-technical systems. As part of his research, Alvar Closas from IWMI looked at 22 solar-powered irrigation projects that are being implemented in Egypt and he observed that in addition to not comprehensively evaluating the impact of their interventions, many initiatives work in isolation and rarely collaborate. This highlighted a common issue in the development field; the promotion of the ideology/methodology/technology du jour on a global scale regardless of whether it suits the specific context at hand. Closas stressed the need to think clearly about the purpose the proposed technology will serve, the tradeoffs, and how benefit from the technology can be maximized through synergies and cooperation. Too often development projects are implemented without having their intended impact, or are not sustainable in the long run. In a Q&A session, representatives of various local rural communities voiced their complaints about many of the “traditional” water and energy generation projects implemented by government entities in their local communities, as well as some of the renewable energy technology projects introduced by the private sector. According to them, the projects did not always meet their actual needs, and that the technologies used in these projects were not always suitable for their environments. This echoed the views of Richard Tutwiler, Director of RISE, that the implementation of projects is an important issue that cannot be overlooked. A pivotal component to the implementation and sustainability of the project is the involvement of the community in all steps of the process from project inception to implementation and management as elaborated on by Abu Bakr Bahaj. Bahaj represented the Energy for Development Network (e4D), which aims to provide energy access for the rural poor and invigorate rural communities to attain economic growth. So far e4D has implemented six community-managed solar mini-grid projects geared to provide communities with electrical power, clean water, capacity building, and access to microfinance in Sub-Saharan Africa. According to Bahaj, the first step in the process is to understand the local community’s needs and the social, economic and cultural context. The community should be involved in determining its needs and aspirations as well as its abilities. This is followed by the stage of selecting the most suitable technical intervention that is in line with the resources and the community’s needs and aspirations. Finally, a capacity building component has to exist to ensure the sustainability of the project past implementation. e4D implements this methodology in its projects by establishing local cooperatives to oversee the management, maintenance, and expansion of the projects to ensure their sustainability. 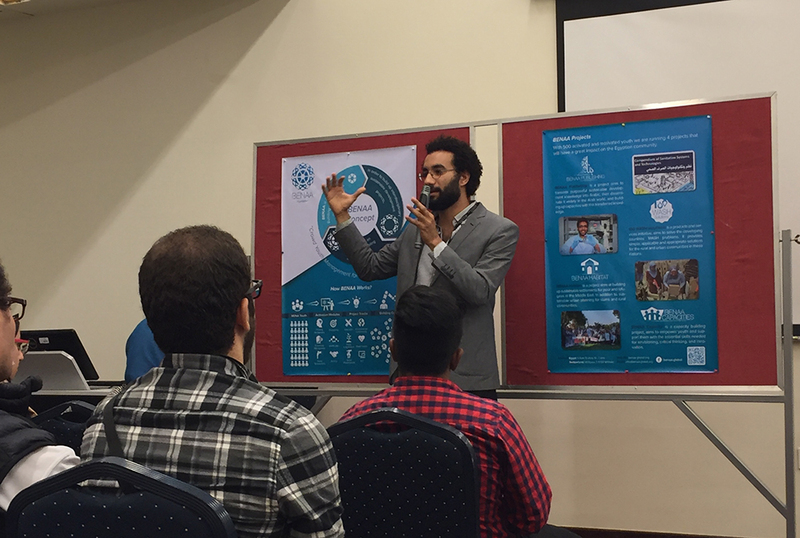 Tutwiler reaffirmed this community engagement focus as he discussed the “community-based natural resource management” concept, which RISE attempts to implement in its development projects in rural communities in Egypt. Community-based natural resource management is the management of natural resources using communally owned facilities. This management approach emerged a couple of decades ago in response to traditional approaches to project implementation that were highly dependent on bureaucratic and centralized decision-making. The aim of this approach is not only the wise management of resources, but rather fostering community development and local decision-making. The conference showcased a number of projects that have succeeded in creating a positive impact on the communities in which they were implemented, either by supplying them with clean water or providing them with a sustainable energy source. One such project is RISE’s “Sustainable water management in the Oases of Egypt’s Western Desert.” Water is extracted from the Nubian sandstone aquifer in the Western desert’s oases, which is high in iron and manganese. Without water filtration systems villagers relied on traditional clay pots (zīr) to filter the water and purify it from some of the water-borne bacteria. Conventional water purification systems installed in the oases were not effective due to the lack of reliable energy source in these remote areas. RISE’s project aimed to provide the residents with clean and safe drinking water in the oases of al-Ḥīz and Abū Minqār. Given the remote location of the oases and the difficulty the residents would face in obtaining spare parts, the system to be developed had to require minimal parts and maintenance. The system installed, which won various sustainability prizes in Germany, and its performance was presented by Alexander Goldmeier from Autarcon, the implementing company, in collaboration with some of the residents of the villages who confirmed the system’s success in their hometowns. To ensure the sustainability of the project the company provided locals in the two villages with operations and management training to maintain the station. The project’s initial capital costs were covered by a donor agency, however, operations and maintenance costs are covered by the project revenues. RISE is currently researching possibilities of creating a business model in which a small operator can run the project on profits. Another successful example is KarmSolar’s experience in planning, designing and installing systems for rural electrification in remote areas in Egypt as explained by Omar Hosny. In Egypt’s Eastern Desert between Marsa `Alam and the Sudanese border many people still live a nomadic lifestyle. As such, they needed mobile electricity systems and that is how the idea of providing solar lanterns emerged to cater to the needs of the residents. KarmSolar has also worked in the Western Desert in al-Ḥīz where they provided electricity for residential consumption using individual solar systems. Similar to the community-based natural resource management ideology, KarmSolar involved the local community –with varying success– to ensure the long-term sustainability by building their capacity to install and maintain the system. Two sessions were dedicated to discussing the future of renewable energy. The first session was concerned with the financing models and payment schemes for water and electricity, whereas the second consisted of a panel discussing on how to best promote the utilization of renewable energy for electricity and water supply in Egypt. Financing was an important issue that arose frequently throughout the conference. Aulich expressed his view that there is a huge customer base for energy around the world and the technologies needed to cater to that base are available. However, there is no way that supply can meet the demand as people who are deprived of energy, mostly in rural and/or remote areas, are unable to access bank loans to pay for the initial investments needed. The limited financial resources of these communities are met with inadequate government investments in this sector on a global scale. According to Aulich, energy, electricity and clean water are mass-market needs that cannot continue to be financed through grants. Therefore, the need exists to find mass-market business solutions for this mass-market need. Often, however, private investors are hesitant to invest in the Global South in these sectors because of the associated risks. He sees that governments on the other hand, do not have the funds to finance initial investments. However, other views claimed that the issue is rather the misallocation of available public funds, rather than the limited financial resources. Access to electricity and clean water were a priority to most international donor agencies over the past few decades, with numerous funds granted to government agencies allocated for that purpose. However, public investments often favor traditional systems. It is therefore crucial, particularly when the people to be served are marginalized, to find ways to lobby the government and the international community to make those initial investments in renewable energy systems. However, it was recognized that in the current political and economic climate this might be difficult. Another important point made was the importance of a shift in governments’ thinking. Resident representatives spoke about the inefficiency of many of the government-implemented water systems in rural areas. A resident of Abū al-Ghusūn pointed out that the water desalination plant installed by the government in his village produced water that was unsuitable for consumption. Another speaker talked about the large-scale centralized wastewater treatment stations installed by the government in rural areas, which are often less efficient than small-scale decentralized ones. These examples point towards the need for the government to re-evaluate how the little funds the government has ought to be spent. The right to adequate standards of living including adequate housing is recognized in Article 11 of the 1966 International Covenant on Economic, Social, and Cultural Rights. Further, the right to safe water is stated in the UN Commission on Economic, Social, and Cultural Rights’ (CESCR) General Comment no. 15 on Article 12 of the International Covenant. In recognition of the urgency of the situation to provide electricity access to over 1.2 billion people worldwide, a majority of the speakers and the attendees seemed to push for business solutions to the issues of rural electrification and access to clean water. There was recognition by a number of speakers that the state is an important stakeholder. However, there was also a general view among the speakers that often states in the Global South are unable or unwilling to invest in renewable energy technologies. Therefore, due to the urgency and importance of access to energy and clean water, we ought to focus on solutions through working with private investors and donors to create working business models to close that gap. However, as rightfully pointed out by one of the speakers, it is difficult [and potentially unethical] for the private sector – whose ultimate goal is maximizing profit generation – to be heavily involved in these essential service sectors without proper government oversight. TADAMUN, has previously raised the issue of privately-run water treatment facilities selling drinking water to Egyptian village residents at higher prices. Even though such initiatives fulfill an acute and urgent need, it takes away the responsibility of the government of finding sustainable long-term solutions. Another important question raised by one of the speakers was about equity. Why should governments not subsidize and pay for the basic infrastructures needed to connect rural areas to sources of energy when they have paid for already connected areas? Why should poorer segments of the society bear the burden of paying higher prices for the service or not be served at all or offered poor quality services? Those questions remained open. While the conference fulfilled its goal of showcasing a variety of inspiring alternative technologies that can be used for rural electrification and provision of access to safe drinking water, it would have been interesting to dedicate more time to the discussion of current policies and institutional frameworks that govern decision-making in those sectors and solutions that incorporate state actors. 1.The conference was held in collaboration with the German University in Cairo and the Technical University Berlin al-Gouna campus, in addition to, Autarcon, SolarInput and Sustainable Concepts, German companies focused on renewable energy. 2. Cross-impact is the interrelationship between seemingly unrelated events and developments. Cross-impact analysis is a methodology developed by Theodore Gordon and Olaf Helmer in 1966 to forecast how the relationship between events will impact future events.